SGI(Soka Gakkai Internati) EMF Crime damage record: Portable bad connection. It is a shock wave in the skin that causes itching. Portable bad connection. It is a shock wave in the skin that causes itching. There are two this topics. One is a problem of happening when it tried to connect carrying with PC, and to move data. After all, the electromagnetic radiation crime made trouble. I am taking a picture chiefly with a portable camera.Thus, video and the image of damage due to the electromagnetic radiation crime are taken of a picture. Recently, carrying was connected by using USB for PC. Video and the image of which it took a picture were moved by the above-mentioned method. The image below is an application used when data is moved. 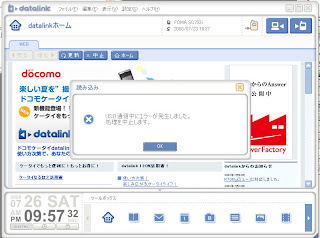 The display of the USB error is seen in a center part of this image. In this error, a usual error is quite different. Because peripheral Soka Gakkai believers shoot the electromagnetic radiation into this portable main body, and abnormality has been caused in the voltage and the electric field in the airframe. Therefore, USB cannot recognize a portable equipment usually. This is a thing that turns out measuring the electromagnetic radiation irradiated to carrying. Terrorists of Soka Gakkai try to conceal his criminality. It is thought that the movement of the data of animation and the image that takes a picture of the crime site is obstructed, and it will execute further criminality. It is a very mean way. electrical appliances also cause the mis-operation is possible. Such a display appears on the next cleaned day though the animation that is below is an air conditioner of my home. When the electromagnetic radiation is measured because it is a very strange phenomenon, interesting result. into the power supply part of this air conditioner. Electrical appliances mis-operate surely when the electromagnetic radiation is shot by the believer of Soka in the surrounding. Another topic is a topic of the shock wave that causes itching in the skin. The electromagnetic radiation crime victim of this cult Soka Gakkai is attacked by often abnormal itchy. I have been attacked by itchy of this since last year. And, this knew that the electromagnetic radiation that the Soka Gakkai believer irradiated was a cause because of a simple measurement. However, it was a mystery whether what wavelength attacked victim's body. cause of itchy of that recently. He is a victim of the electromagnetic radiation crime that cult Soka Gakkai does as well as me. It is irrelevant man to Soka Gakkai as for him and me. However, Soka Gakkai does criminality to an unrelated civilian. When strange itchy of this happened to his body, he measured the true colors of itchy with the equipment that remodeled IC recorder. It analyzed from the record, and the true colors of itchy turned out a shock wave shot at about 25ms intervals. The crime victim of a lot of Soka Gakkai suffers from itchy of this. And, it is not only human then that suffers. The Soka Gakkai believer shoots the same shock wave into victim's pet. 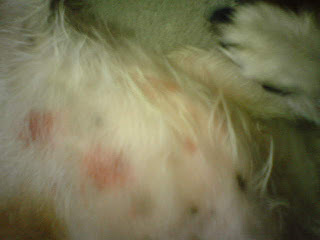 The shock wave damage of typical itchy is shown. It is a pet dog of my home. Do the pick of this dog of the ear and the body always by itchy. This dog took a picture in video below immediately after the body was washed. The helminth and the skin disorder are healthy dogs that do not have it. Skin that was scratched because of shock wave that causes itching and broken.